Sugar Ray Leonard, the iconic fighter of the 70s through the 90s, suffered his first defeat at the gloved hands of another iconic fighter, Roberto Duran, up in Montreal, Canada back in 1980. It was a tough loss for Leonard, who had been tricked by Duran into engaging in a slugging contest. Leonard learned from his mistakes, however. After coming back to beat Duran less than six months later, the legendary American boxer went on to several more decades of success. As Leonard himself once claimed, he wouldn’t have become the fighter be became had he not lost to Duran all those years earlier up in Montreal. It’s was the kind of lesson Ledarius “Memphis” Miller has learned from, as well. It’s easy for people to pull close to Miller at the moment. The lightweight has earned six impressive wins since that defeat, most of them via stoppage. 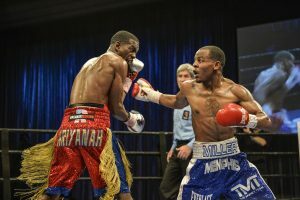 And now he’s set to face the 10-7-2 Jose Marrufo this Friday evening in Las Vegas on the undercard of the Tony Harrison-Ishe Smith bout, which will be aired live on Bounce TV. “He’s a pretty tough veteran,” Miller, now 15-1, says of his opponent. “Camp’s been great. I probably had a good 8-9 weeks.” Miller claims he “had a chance to get some great sparring” in with the likes of Ashley Theophane. A product of Memphis, Tennessee, Miller eventually decided to head west to Vegas in order to pursue his dream. “I had an uncle who was already out here,” he says, “and he was a fan of boxing.” Miller had a solid amateur pedigree, but knew he had to make a change. “I was just training and I wasn’t fighting,” he says of the amateur experience, where so much can depend on funding. “I ended up getting out to Vegas and the rest was history.” Yet, unlike many ambitious fighters, Miller ended up becoming a member of Team Mayweather. “He’s been handling my career,” Miller says of Floyd Mayweather. “I see him frequently. 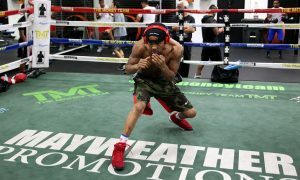 Sometimes he stops by the gym.” Unlike some fighters on the rise, Miller has nothing bad to say of the promotional company behind him. “I’m happy with Mayweather Promotions,” he says. “They’re one of the best promotions out there…they’re always behind me, supporting me through good and bad.” To be sure, Miller is happy with his development in the pro ranks. “I had a pretty decent amateur background,” says Miller. The truth, though, is that he was meant to fight in the professional realm. “The pros were meant for me,” he states, adding that people would tell him: “You got a pro style,” back when he was younger. “You’re really going to show your stuff when you get into a 10-12 round fight,” Miller also recalls people saying. Now that he’s back on track, however, the fighter isn’t about to forget the lessons of the past. “I learned,” he says, “that you cannot underestimate anyone in this game.” It’s a lesson far too many fighters have neglected to learn over time. “It humbles you,” he says of his lone loss. “It angers you, it motivates you.” Yet, as many a fighter has learned, a pitfall can be a wonderful teacher. “You keep saying ‘I can’t let this happen again,’” Miller ads. Which perhaps is why Miller now aims to treat each bout like it’s for a championship. Many may not know who Marrufo is, but Miller is well aware of the fact that Marrufo undoubtedly would like to change all that. “Every fight,” Miller says, “is my most important fight.” Although the lightweight clearly has plans for the future his “main plan,” at the moment, “is May 11th” in Vegas. Although he’s yet to start a family (“My main focus is to stay in the gym”) Miller intends to use his career to help those he will one day have to support. “I want to be able to take care of myself and my family,” he says of the future. If all continues to go as planned, it will be a future of some note. Having a supportive team can lead to big things, after all.